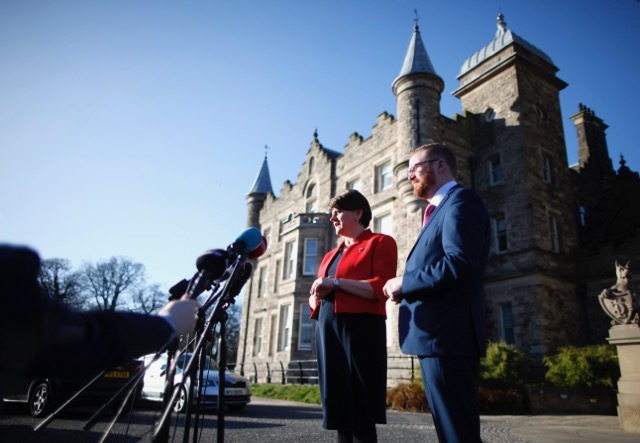 DUP leader Arlene Foster and Simon Hamilton MLA speak to the media before talks at Stormont Castle. This was the prayer shared by Father Canny of St Columba’s Church in Derry/ Londonderry as he joined with other clerics in leading the congregation in prayer at a Service of Thanksgiving to mark the 400th Anniversary of the founding of Foyle College in the city in 1617. As he did so, the results from the election of the previous day were revealing the political profile of those representatives we have elected, whether or not we voted. Even after years of power sharing, European-funded Peace Programmes, Shared Education and numerous community initiatives and gestures aimed at promoting reconciliation, we remain a deeply divided, troubled and fragmented community. This cannot be a sound basis for talks aimed at restoring a form of government focused on providing effective political leadership for the whole community especially where ultimatums have been placed on the table even before talks have begun. The unyielding intransigence of brinkman-ship politics,serving only to raise passions, is being brought to the heart of governance and the political strategists and leaders of the two big power blocs would do well to think again. Every action and decision has a consequence and it is not always the one intended. The DUP have just learned this to their electoral cost. The political process at Stormont can only be as productive as politicians are motivated to make it. Stabilizing peace and security, economic development and employment opportunities, quality driven healthcare, educational opportunity, investment in infrastructure and general wellbeing are a given on most personal agendas but following the election the focus is beginning to pivot around personalities and highly charged negotiation. Some individual needs to step up to the mark, untie the knot and lead the community forward instead of trying to act as guardian of a position that is no longer sustainable. There is no escaping the fact that, as leader of the biggest party, as potential First Minister and the main leader of unionism at this time, the onus is on Arlene Foster MLA to respond and any response has to go beyond wanting to unite unionism and build a tribal headcount within one party. The only result of such a strategy will be that unionists can jump off the cliff together. Unionism needs to widen its cultural, social, and demographic appeal, not narrow it. There are two ways to break a block of ice. You can hammer it or melt it. The DUP hammer has not worked. Prior to the election, the DUP leader and the party uncaringly and selfishly turned its back and put its hand over its ears not least over Brexit. All that it succeeded in doing was to create space for the weakening and further discrediting of unionism and hand an opportunity to other parties to build momentumand resentment towards the delivery of their wish list. Given the nature of much of unionist politics and changing demographics, it was only a matter of time. Anyone who is surprised has not been paying attention. Too many unionist leaders and representatives from across the spectrum behave like a mouse in search of a cat. Focused on fear, you become fearful and compliant to fixed ideas. Fear contaminates anyone’s politics. It betrays a lack of trust in your own policies, values and belief to say nothing of the ability to present persuasive and convincing argument. False confidence, partisan edicts, secret superiority and a desire for communal supremacy, expressed in offensive terms, serve only to create tension and further complicate complex issues. The community becomes caught up in a swirl of bad politics and unionism remains blind to its own ignorance. Many of these young people, uncomfortable with prejudiced attitudes towards social justice, bellicose and politically loaded, rather than culturally enriched pageantry, need little encouragement. The leader of the DUP can justifiably claim a mandate to retain the leadership of the party but her credibility in considering the retention of the position of First Minister is more problematic. Apart from the rumblings within the DUP and the need to eat humble pie, a remark possibly to do mostly with settling old internal party scores, most of the parties have received a mandate not to endorse the DUP leader as First Minister. This is inescapable. To fly in the face of this, will present as the same rogue defiance of a Petition of Concern being deployed to curtail debate and manipulate democratic expression. Increasing discontent and division will get in the way of possible agreements. Unionism will be weakened further. The DUP leadership must now realise that their leader should have stood aside before the election. Many of their members, including elected representatives say so privately. The best option in the current situation is for the DUP to table the right to nominate their leader but set this aside in the interests of creating an atmosphere conducive to positive agreement. Their quality of commitment to the community can then be measured, not by focusing on what has happened but on a positive response to it. It is very likely that the British and Irish governments have been preparing for all eventualities and that strategies and proposals are in hand if not already on the table however it seems that negotiations could prove difficult and tortuous. The DUP as the largest party and the main, if not the only, architect of the current situation, has the opportunity to turn the tables on what is mastering society and lead us away from potential chaos and continuous disruption. Inspiration to do so is present in the prayerful words of Father Canny. March 9, 2017 in News & Current Affairs. Unionism has nothing to fear from an equitable society but the DUP’s negation and disdain of what many believe to be fundamental rights has alienated many who are supportive of the theory of shared governance. Arlene needs to get a spoon ready for the dessert… Its pie.